Half of a very finely woven kilim originally in two panels. The dark brown ground of the field is almost entirely covered in a dense repeat of large carnations arranged in horizontal rows of alternating colours. One of the most popular motifs of Ottoman court art, the carnation was adopted by Anatolian nomads into their own design repertoires and adapted to the geometric style of their flatweaves. This carnation kilim was probably woven by a Hotamis-Turkmen tribal group in the Nigde region. Among the comparative pieces cited, with provenances in different regions of Anatolia, the carnation kilim published by Eskenazi/Valcarenghi is identical in border design and thus closest to the Poppmeier example. – Minor holes, good overall condition. Mounted onto canvas. The small town of Elmadag (translation: apple hill) some 40 kilometres from Ankara gave this distinctive kilim group its name. Elmadag kilims are easily identified by their specific palette, their dense designs of geometric devices with parmakli outlines and their characteristic elems. They were almost always woven in a single panel. Two main design types are known, either compositions of large nested diamonds or horizontal stripe designs, as seen in this kilim. The four wide bands – light red, blue, red and light green in ground colour – contain large nested diamonds with parmakli outlines and are separated by sets of three dividing stripes composed of interlocked stepped chevrons and comb motifs. The overall appearance is enlivened by several motifs woven in brilliant white cotton. In the upper elem, highly stylised carnations combine into a design band on a brown ground. – Reduced in length, the lower elem is missing. Good condition. Offset horizontal rows of monochrome elibelinde designs combine into an expressive repeat in the dark brown field of this long, single-panel kilim. Arranged in horizontal rows by colour, they represent the closed type rather than the type divided into two halves. The primary motifs are spaced to create an appearance of hermetic closeness. They cover almost the whole of the dark brown field where the wefts are so heavily corroded that the white warp threads are exposed everywhere. The white-ground main border presenting fork motifs in an in-and-out rhythm is separated from the field by arrow designs resembling crow’s feet; the outer sides are decorated with short crenellations. Only a very few examples of this rare kilim type have been published. The Poppmeier example is certainly one of the oldest of the group. – Several rewoven sections, obvious signs of age, mounted onto canvas. This single-panel village kilim was woven in the Mut region in the foothills of the Taurus Mountains. Kilims have probably been woven in that location for a very long time. Settled for thousands of years, the area was traversed by the old military road which led from Central Anatolia to Cilicia, resulting in an exchange of goods as well as designs and motifs. – A dense repeat of large interlocked elibelinde motifs is arranged in offset rows on the light red ground of the field, combining into colour diagonals. Typical of the Konya region, this primary motif is comparatively rare in Mut kilims where the gülbudak design is far more frequently encountered. The field is surrounded by a narrow, yellow-ground border of double hooks, most of them dark brown. The comparatively coarse weaving structure on a thick black-brown warp and the curvilinear style of drawing using eccentric wefts are characteristic features of Mut kilims. – Several restored areas, rewoven upper finish, good overall condition. Besides monumental kilims featuring massive motifs and large free spaces, the collector was also fascinated by kilims like this early two-panel example from Konya, which stands out on account of the extraordinary richness of its subtle shades and nuances. The hermetic design covers the field so completely that it is impossible to discern a continuous ground colour. It consists of two types of hexagon different in size and interior design which are endlessly repeated, sharing brown-and-white outlines. Although fairly simple in concept, the sharp reciprocal effects and distribution of colour with no recurrent pattern create an impression of extreme complexity and diversity. The vertical bands of the narrow white-ground border are decorated with mirror-image double hooks, while the horizontal bands show highly stylised carnations. – Various missing sections, corroded brown, distinctly patinated with age. Mounted onto canvas. To date, this Karapinar kilim is the only published example of the so-called "baklava" group featuring just three compartments. Its primary motifs are considerably larger and more powerfully drawn than those of the comparable Karapinar kilim, lot no. 7. 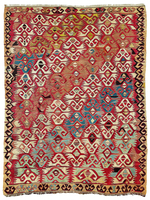 Similar to a kilim from the Vok Collection (see below), the ground of this kilim is not all white, but the compartments show different ground colours – aubergine, red and red-brown. The four horizontal bands which flank the panels contain hexagonal cartouches enclosing S-figures. The fine weaving structure and transparent colours are certain indications of great age. – Corroded light brown sections, several missing areas. Mounted onto canvas. Very finely woven in a single panel, this village kilim was made in the surroundings of Kütahya. It is probably a product of a Turkmen tribal group who had become sedentary. A huge cruciform device, its wide crossbar decorated with inverted elibelinde motifs, divides the blood-red field into four segments which are empty but for a large double hook design at their centres. The basic concept of this composition evokes associations with Turkmen ensis. The vertical borders consist of boxes with lateral parmakli outlines enclosing double hook motifs, while the horizontal borders are simply narrow plain stripes. Two wide elems complete the kilim at both ends. – Rewoven sections in the central field, slight damage to the corners, good overall condition. Woven in a single-panel, this large kilim was probably made by a Saçikara Yürük tribe in the Sivrihisar area. The light and mellow colours are an indication of considerable age. Four wide panels each contain a double niche motif with lateral parmakli outlines and serrated points in which a smaller, analogous, nested form encloses two serrated diamonds. The three white-ground dividing stripes are decorated with vines, and elibelinde motifs arranged in an in-and-out rhythm adorn the narrow elems. A further example of the group is in the collection of the Vakiflar Museum, Istanbul. A kilim published by Koll/Steinbock also compares well. – Several major missing sections, partially incomplete sides and ends. Mounted onto canvas. A large Yüncü Yürük decorative bag woven in a horizontal stripe design. The face is elaborately decorated: the wide design bands present offset rows of steel-blue hooked diamonds on a red ground; the narrower stripes show bands of small hexagons. The designs in the dark colours typical of the tribe are embroidered in the brocading technique, while the plain blue-black and red dividing stripes are woven in the kilim technique. The back shows a simple design of horizontal stripes. – Known as chuval or çuval, such bags were used to store household goods or food supplies; however, lined up in rows along the walls of these settled nomads’ houses, they also served an important decorative purpose. – Damaged and partially incomplete sides. Minor repairs. A fragment of a narrow vertical border. The original side finishes are still preserved so the border was no wider, but probably a good deal longer than the surviving section. Ten large, two-dimensional double hooks in dark and light blue, green, rust red and shades of brown have been placed on a white ground. The high degree of patination of the colours can be regarded as an indication of age. The border probably belonged to a kilim from the Konya region; a more precise attribution would be pure speculation. – Missing sections along the sides. Mounted onto canvas.